A regular deployment takes about 60 minutes, and an HA deployment takes about 75 minutes. The Quick Start includes AWS CloudFormation templates and a deployment guide with instructions. IBM Cloud Private is a scalable cloud platform that can run on any on-premises infrastructure that's managed by either VMware or OpenStack, or on any cloud environment. IBM Cloud Private is used for developing and managing containerized applications, and includes the container orchestrator Kubernetes, a private image registry, a management console, and monitoring frameworks. This deployment includes preinstalled transformation tools and step-by-step guidance. You can use the IBM Cloud Transformation Advisor tool to determine what to move to IBM Cloud Private, and to get recommendations. You can also explore platform features that IBM Cloud Private provides to achieve a production workload. 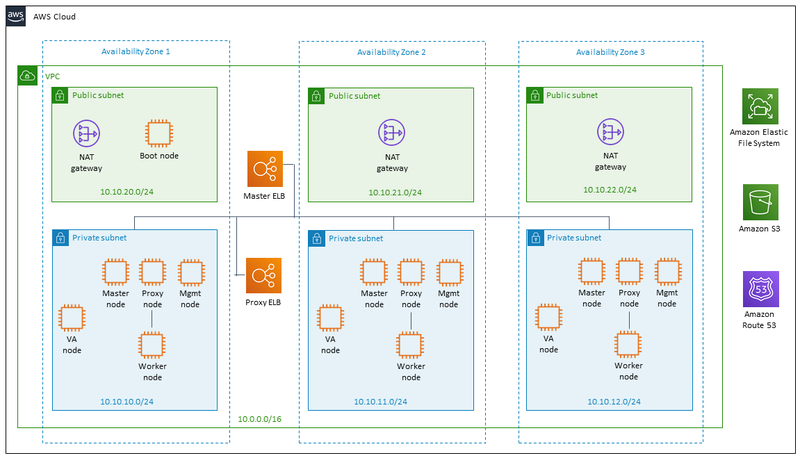 A highly available architecture that spans three Availability Zones. A VPC configured with public and private subnets according to AWS best practices, to provide you with your own virtual network on AWS. Managed NAT gateways to allow outbound internet access for resources in the private subnets. Two Network Load Balancers to provide Elastic Load Balancing (ELB). There is one load balancer (master ELB) for the master nodes and another (proxy ELB) for the proxy nodes in the private subnets. The load balancers are placed in the public subnets in each of the chosen Availability Zones. Access to cluster administration is limited to the public ports via master node ELB. Access to applications is limited to HTTP/HTTPS via proxy node ELB. A boot node in one public subnet for command-line cluster administration tasks. An Amazon Elastic File System (Amazon EFS) file store, deployed for use by applications that need shared storage. A Kubernetes dynamic storage provisioner is configured to use the EFS storage as part of the IBM Cloud Private deployment. Optionally, Amazon Route 53 as your public Domain Name System (DNS) for resolving domain names of the IBM Cloud Private management console and applications deployed on the cluster. Launch the Quick Start. A regular deployment takes about 60 minutes, and a high availability (HA) deployment takes about 75 minutes. (Optional) Edit the AWS security group. Configure the DNS or hosts file. (Optional) Edit the application security group. Provide boot node SSH access. The AWS CloudFormation template for this Quick Start includes configuration parameters that you can customize. Some of these parameters, such as instance type, will affect the cost of deployment. For cost estimates, see the pricing pages for each AWS service you will be using. Prices are subject to change. Tip After you deploy the Quick Start, we recommend that you enable the AWS Cost and Usage Report to track costs associated with the Quick Start. This report delivers billing metrics to an Amazon Simple Storage Service (Amazon S3) bucket in your account. It provides cost estimates based on usage throughout each month, and finalizes the data at the end of the month. For more information about the report, see the AWS documentation. When you deploy the Quick Start, you receive a trial license of IBM Cloud Private for up to 90 days. After 90 days, you must either purchase or uninstall. To get pricing information, or to use your existing IBM Cloud Private entitlements, contact your IBM sales representative at 1-844-952-5683, priority code: Cloud. For more information about licensing terms, see the IBM Cloud Private software license agreement.